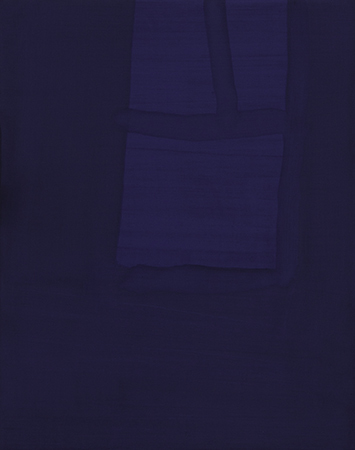 Alison Hall, Shroud I, 2017. Oil, graphite and plaster on panel, 9.5 x 7.5 inches. Courtesy of the artist and TOTAH. TOTAH presents unannounced, an exhibition of new paintings by Alison Hall. This is the artist’s first solo exhibition with the gallery. Hall’s recent paintings examine ritual and repetition in form and process, looking to the early Renaissance—specifically Giotto’s Arena Chapel—and drawing on the labor patterns of rural Virginia, from where the artist hails. Hall begins each panel by applying and sanding layers of plaster, which she then paints in rich coats of black or blue oil pigment. She covers these in meticulous, dense fields of patterning in graphite. These gridded planes are almost liquid, a sea of marks floating between fore and ground; the pressure of Hall’s hand shifting the relationship between each measured mark. Suspended over the painted surface, these drawings appear or disappear, subtle deviations introducing a presence—like a shadow or reflection—depending on the light and the orientation of the viewer. Hall speaks of studying painting with Stanley Lewis—”he would point out how a distant vertical or horizontal intersected perfectly with something right in front of your face, uniting distant space to the very thing right before you”. unannounced is inspired by this patterning of our existence. From the relationships between the smallest graphite marks, to the relationship the artist has to the vast history of painting, relationships are perhaps the most important form in these works. unannounced grants a closer look at the passage between states, whether between Giotto’s 13th century stars and the chapel’s 16th century floor, or between the routine of rigorous labor and transcendent spaces. This is Hall’s contribution: forms departing and arriving, expanding and contracting all at the same time. The exhibition will be accompanied by a publication including texts by Director of Graduate Studies and Professor at NYU’s Institute of Fine Arts, Alexander Nagel and art historian and Princeton doctoral candidate, Alex Bacon. TOTAH is a lower east side gallery dedicated to reengaging the alchemy between artist and gallerist. We align artist, practice, thought, and audience, presenting emerging and established talent in solidarity with a culture of authentic expression.